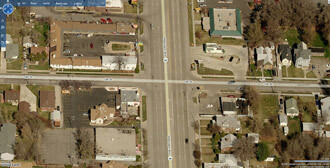 The death of Mrs. Minerva Pease Shaw, one of the earliest residents of Ogden, Utah occurred today at her home. Mrs. Shaw fell at her home Friday and suffered a leg fracture. She was a prominent pioneer who had resided at six twenty-five a.m. today at the family home 1265 Washington Avenue. Mrs. Shaw slipped while watering her lawn Friday afternoon and broke her left leg. Only a few days before, she danced "Turkey in the Straw," at the stadium to show the younger generation how it was done, a small boy playing the tune on his violin. She was born in Bountiful, Davis county, November 29, 1851, a daughter of Amos Pease and Minerva Leantine Jones Stones, pioneers of 1850. She was married to Ambrose Shaw January 1, 1875, in North Ogden. Mrs. Shaw was active in social circles in the earlier part of her life and was a member of the Tolstol circle. She was a member of the L.D.S. 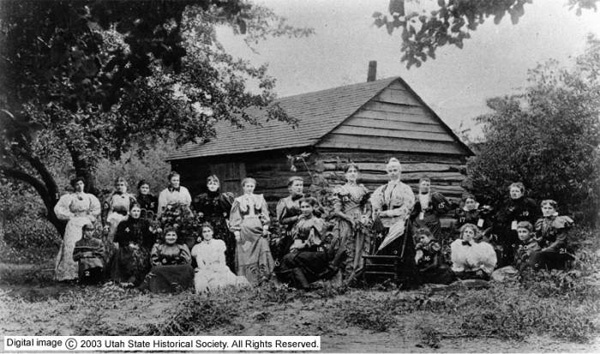 church and active in Relief society and other organizations of the Tenth ward, North Weber stake. She was the head of the relic department of the Daughters of Utah Pioneers, DUP and spent much of her time in collecting relics even to the time of her death. Her son Ambrose A. Shaw used to drive her around collecting relics. Mrs. Shaw was a great lover of music and to be a musician was her main ambition. 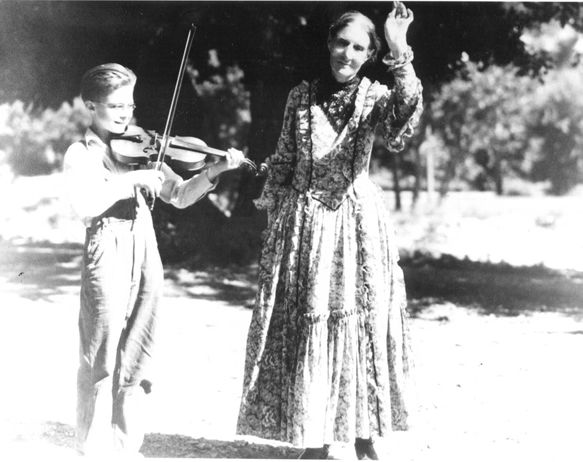 Circumstances prevented her from following a musical career, but she procured a violin and learned to play the old dancing tunes by ear. She has played at many old time gatherings and was quite a comedienne also. Mrs. Shaw was a keen advocate of physical culture, claiming it did much to keep her young and active. After completing a course in this study, she taught it for a short while. She taught it for a short while. In 1911 she homesteaded a piece of property at Inkom, Idaho. She spent part of her time there. Although 85 years of age, she was active up to the time of her accident Friday. At the time of her death she was survived by the following children: Ernest and Merlin Shaw and Olive Theresa (Shaw) Gordon all of Ogden; She was also survived by one sister, Laura Stone Tribe of Ogden, Utah. Photograph of her family, Ernest, Minerva, Merlin, Ambrose, Ambrose Amos, Theresa Shaw. The last owner of the Miles Goodyear Cabin was Minerva Pease Stone Shaw, was born November 29, 1851, in Bountiful, Utah, a daughter of Amos Pease Stone and Minerva Leontine Jones Stone. Her parents arrived in Utah on September 3, 1850, from Connecticut and they made their home in Sessions Settlement (Bountiful) until March 25, 1857 when they moved to Ogden where they spent the remainder of their lives. Amos Pease Stone was a blacksmith by trade. At first the Stone family lived with Minerva’s great-grandparents, Merlin Jones and Roxanna Ives Jones Amos later built a home for his family at what is now 21st Street and Grant Avenue. He constructed an irrigation ditch from the Ogden River to water his garden plot and property. The family consisted of the parents’ (Amos and Minerva), two daughters (Emily and Merab) from Amos’s first marriage to Amelia Bishop, and eight children from the second marriage: Olive Ann, Amos Ives, Minerva Pease, Merlin Jones, Cordelia Hotehkiss, Sylvia, Friend, and Vincy Rice. Minerva Pease Stone (Shaw) attended school for about three months in the winter and three months in the summer. With no grading system, this did not seem to present a problem. She always remembered her teachers. She had an aptitude for spelling and participated with willingness in the local spelling bees between the area schools. There was a small school on l2 Street just West of Washington, another on Washington near what is now 16th Street, and an adobe Structure first owned by John Shaw, the father 0f Ambrose Shaw. Young Minerva was a girl who did not relish the inside work of the home, preferring to be outside and loving the beauties of nature and being close to her father. Throughout her life she wrote poetry about the beauty in the world around her. She was given the job of herding the sheep to their grazing grounds. She would pick pieces of their wool which snagged on the low bushes and take them home to be washed, carded, spun, and woven with other wool into clothing for the family. She remembered running barefoot on cocklebur-lined paths to gather Stray sheep and caring for the motherless lambs. She gathered wood and the tall, strong, abundant sunflower stalks for fuel. She often called herself the family chore boy. She was adept at making straw braid for hats. She churned butter and sometimes carried the heavy wooden churn two miles to her grandparents’ home where she would make flutter, then carry the churn hack to her home. She was also assigned to carry the family’s water from the Ogden River. She related how she once encountered an Indian on her way home. Although stopped in her tracks, she managed to keep her wits about her, offering him a drink from her bucket, He drank, returned the bucket to her, and then disappeared. Minerva’s first dance was held at school. She was very shy and afraid to ask anyone to dance. Her teacher led her by the hand to a group of boys and asked one of them to please dance with Minerva. They were both barefoot, and it was a never forgotten experience. When her mother became ill, Minerva assumed the responsibility for her care and the care other smaller brothers and sisters. When her mother died, sixteen-year-old Minerva continued with the household duties. This left little time for other pastimes. Sometime later, her father’s health failed, and Minerva was forced to seek employment outside the home to ease the family’s financial burden. She hired out to help in homes which eventually led her into the hone of Ambrose Shaw. His wife, Pamelia Dun” Shaw, had been ill for some time, and Minerva was to attend and care for her. Pamelia died on March 21 1871. Minerva stayed on as housekeeper, earning one dollar and fifty cents per week. On January 1, 1875, Minerva Pease Stone and Ambrose Shaw were married. She was twenty-three years of age, and he was fifty one. They became parents of six children: Ambrose Amos, Ernest, Eva Pamelia, Cordelia Minerva, Merlin, and Olive Theresa. Little Cordelia Minerva died of typhoid fever in October 1883. In March of 1886, six-year-old Eva Pamelia, as well as a relative living with them (Naomi Jones), died in a tragic fire at their home. Minerva was able to rescue the other four children from the fire in the process, she was severely burned and suffered from the effects for many years. To aid in her recovery, Minerva enrolled in a physical culture course. She studied under the tutelage of the Hoover School of Physical Culture headquartered in San Francisco. She completed the course, received a diploma, and later taught the course to others. To further aid in the recovery of her hands which were burned in the fire, her husband purchased a violin for her, which Minerva learned to play. She became well known for her music and was frequently asked to play for entertainment and dances. She would sometimes dance the old pioneer dance steps while playing her violin. She also played the accordion. Her husband built her a three story brick home on the corner of 13th Street and Washington. It was set back in the yard, leaving a great space in front. She had always wanted a pretty lawn and worked hard to realize this dream. There was a big wood stove in the kitchen and the water was pumped by hand. The living room had a high ceiling and Minerva kept it very tidy. My cousins Laurie and Geraldine (still living)visited Minerva at the house with there parents. After her death, the home and property were sold, and a motel was built there. Minerva related many stories of pioneer life in Ogden. She remembered the area near the Ogden River which was heavily lined with brush and contained many wild animals. There was an abundance of trout in the river along with ducks and other wild fowl. She often gathered box elder tree roots along the river bank to use as hoop for their fancy dresses. A pioneer home was not complete without the old dye tub. Dyes were made from numerous roots, berries, bark, and whatever was at hand to use for coloring their cloth. Colors were set by using copperas, blue vitriol, or alum. Soap was scarce, so scraps of fat were saved from butchering beef or pork and used with leach or lye to make soap. The leach was made by running cold water through wood ashes. Her family lived in a fine two-story home (one room up and one room down) which her father had built. One window was on the east, and the door was on the West and made of heavy slab of wood held together with nails made by her blacksmith father from bits of scrap iron. Minerva’s husband Ambrose was not a member of the LDS Church, and she had not been active for many years. As her husband’s health failed, she began to worry that he was not a member. In January of 1905, through her efforts, he was baptized. They Went to the temple on September 13, 1905. He died shortly thereafter on January 19, 1906. In March of 1907, after her family were all raised and married. She had the opportunity to act as chaperon for a young woman whose father was being released as a mission president in England. They toured England and the continent, visiting many historical sites in France. Italy, Switzerland. Germany, Belgium, and Holland Four years after this memorable trip, she moved to Inkom, Idaho, to homestead one hundred sixty acres of land. She had a small log cabin built and lived there mostly alone for nine months of the year. She used a horse and buggy for transportation and raised grain, garden produce, chickens, and pigs. She gained title to the land as well as water rights. One of Minerva’s great interests in later life was the gathering of relics, and approximately seventy of them are housed in the Weber County DUP Museum in Ogden. Much time was spent and many miles were traveled to find items significant to pioneer history for display in the museum her son, Ambrose Amos. Would often take her to pick up her finds. She also helped in the gathering of many of the old pioneer songs for the DUP song book. Probably her greatest, and accomplishment came from the old Goodyear Miles Goodyear Cabin cabin, now located next to the Weber County DUP museum. At one time, in 1934 or 1935, she was interviewed by Harold H. Jenson, a Church historian. He wrote an article which was published in a local newspaper regarding the history of the log cabin in which she took so much pride. One day in July 1936, she went for a ride with a daughter and daughter-in- law. They drove up the canyon, parked the automobile, and hiked a short way up the mountain. Minerva was able to go faster and farther than either of the two younger women. A few days later, while watering her front yard, she turned her ankle, fell and broke her hip. She died on July 21st, 1936, at the age of eighty-five, the end of a long, eventful, and fruitful life. He was baptized in May 1905, To the Temple Sept 1905, Died Jan 15th 1906. This is Mother, Minerva Shaw's own data. It is Precious I want you to share it. (signed) July 8 1973 Aunt Tress.